While doing some recipe research for inspiration, I came across a few recipes for kiss cookies and I was immediately intrigued. Not only had I never tasted a kiss cookie, but I’d never even heard of it! These soft and crumbly cookies that you can just pop in your mouth looked too good to be true and I had to give them a try. Conveniently, a friend of mine (shout out to Yonina Wind) asked me to bake something for an event she will be attending and I jumped at the opportunity just so I could make these cookies! Wow, that sounds kind of selfish, huh?!? I should have said that I was so happy to bake for her and already had the perfect recipe in mind. Either way, I made the cookies…and they were even better than I expected. Instead of just making a plain kiss cookie, I found inspiration in one of my favorite candies; the York Peppermint Patty. 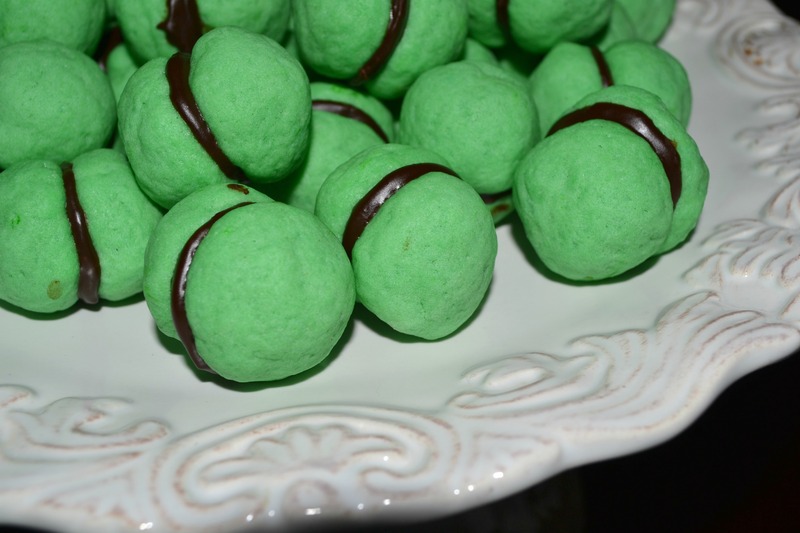 I sandwiched silky smooth melted chocolate between two teeny tiny peppermint green cookies and voila! 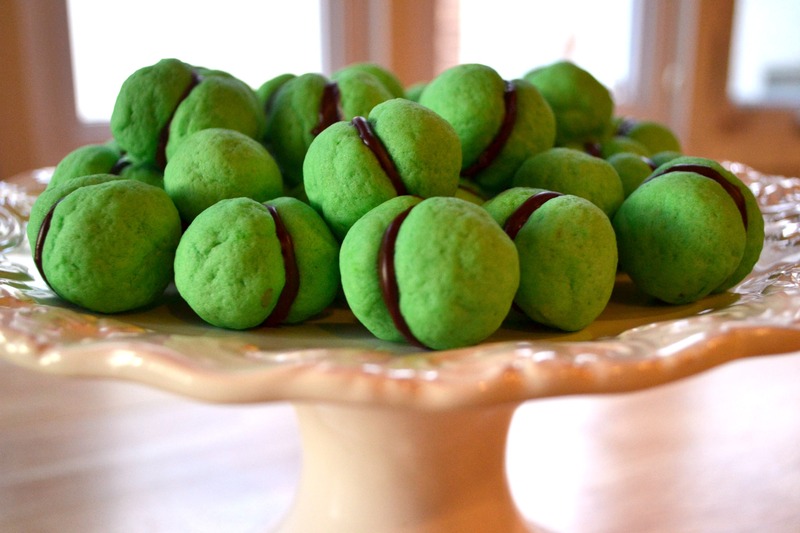 Peppermint Sandwich Kisses! Enjoy. Oh, and if you (or anyone around you) are allergic to eggs, these cookies are perfect for you since there are no eggs anywhere in this recipe! I creamed the margarine, both sugars and salt on medium speed using a paddle attachment until light and fluffy. I added the peppermint extract and the food coloring and beat until incorporated. At this point, you can play with the color until it’s exactly what you want. I added the flour and beat on low until just combined. If you are not happy with the color, you can flatten out the dough, smear a few drops of food coloring and knead until the color is incorporated. 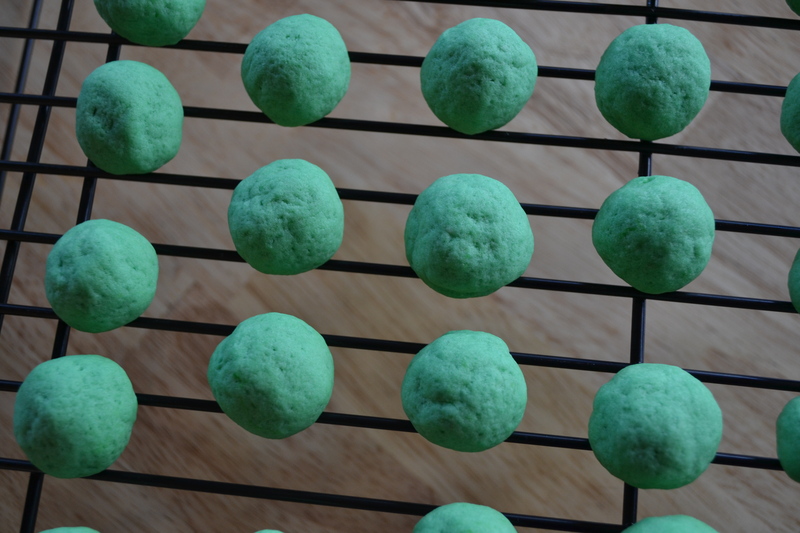 Using a teaspoon, I scooped the deliciously green dough and rolled the cookies as round and smooth as possible since any lines show up after they cook. I placed the balls around 1 inch apart on an ungreased cookie sheet. 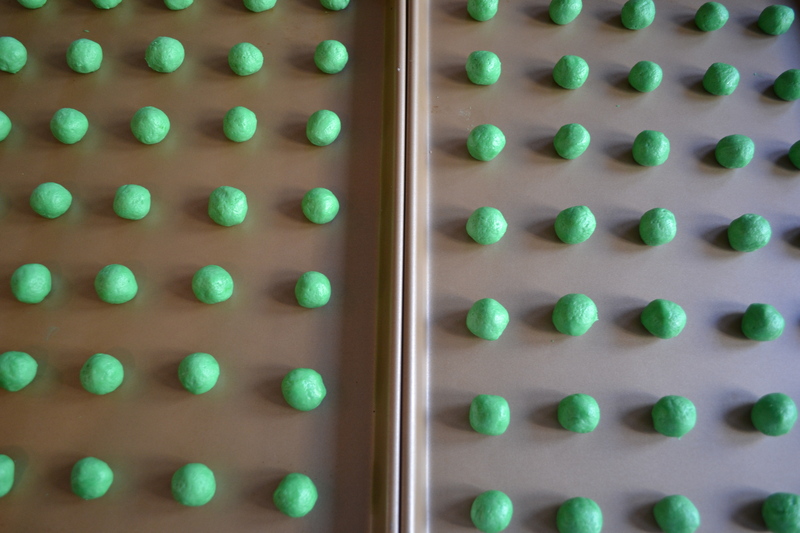 This step took some time since the dough makes around 60 little cookies and each one has to be rolled in your hand. It was totally worth it! I baked the cookies at 350 degrees F for 8-10 minutes, until the bottoms were slightly golden. I let the cookies cool for a few minutes then transferred to a wire rack to cool completely. When the cookies were cool, I make the filling. In a microwave safe bowl, I added the chocolate and margarine then placed in the microwave for 30 seconds. I stirred the mixture then put the bowl back in to the microwave for another 30 seconds. That’s it! 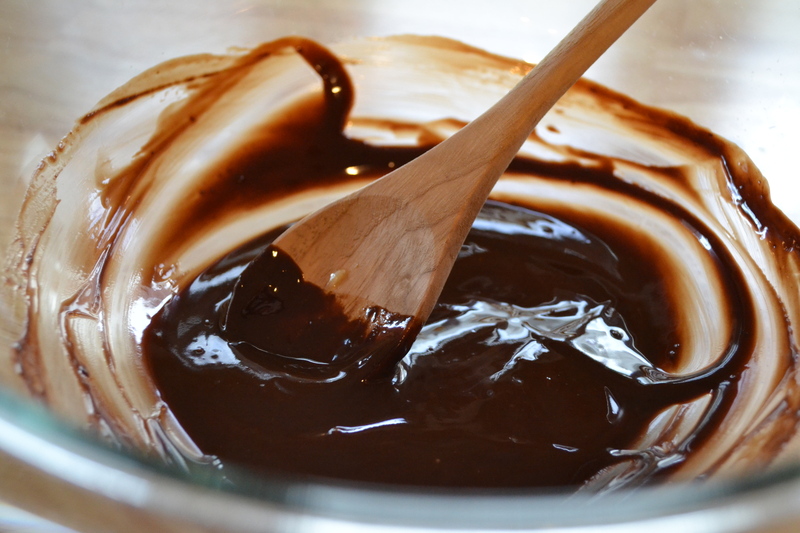 Creamy and silky chocolate in 1 minute. I set the chocolate aside for 10 minutes to cool slightly. Once the cookies and chocolate were ready, I spread a small amount chocolate on the bottom of a cookie using an offset spatula. I placed a second cookie on top of the chocolate to create a sandwich. I cooled the cookies on a wire rack until the chocolate was set. The cookies were more than I could have asked for! Theses adorable little peppermint pillows melted in my mouth and the chocolate center added the creaminess this cookie deserves. You can certainly eat the cookies on their own and they are still incredible but the chocolate and peppermint are a match made in heaven! If you like York Peppermint Patties, this recipe is truly the cookie version and you have to try it for yourself! These cookies will stay fresh for up to 1 week in an airtight container! So great that you can make them ahead of time. Just watch out because they are so cute and small and you might just want to keep them all for yourself. I highly recommend hiding the cookies until you are ready to serve them. Quick Note: if you aren’t a fan of peppermint, you can use another flavor of extract in your cookies. You can even change the colors or do multi-colored cookies. Is there any way to do this recipe without having a Kitchen Aid? I only have a handheld mixer. Do you only have a whisk on your handheld mixer or is there also a paddle attachment? 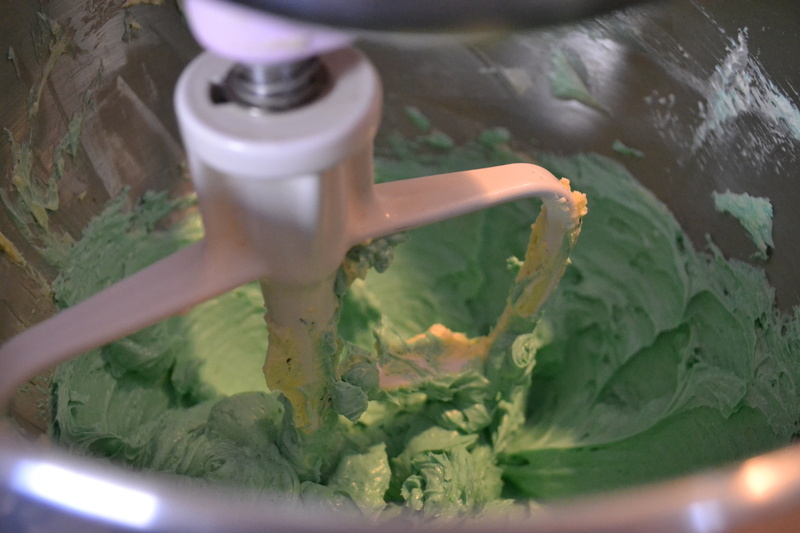 I suggest using a paddle or mixing by hand since the whisk isn’t right for the consistency of the cookies. Only the whisk. Will it work doing it by hand? By hand might work but would be a lot of work. 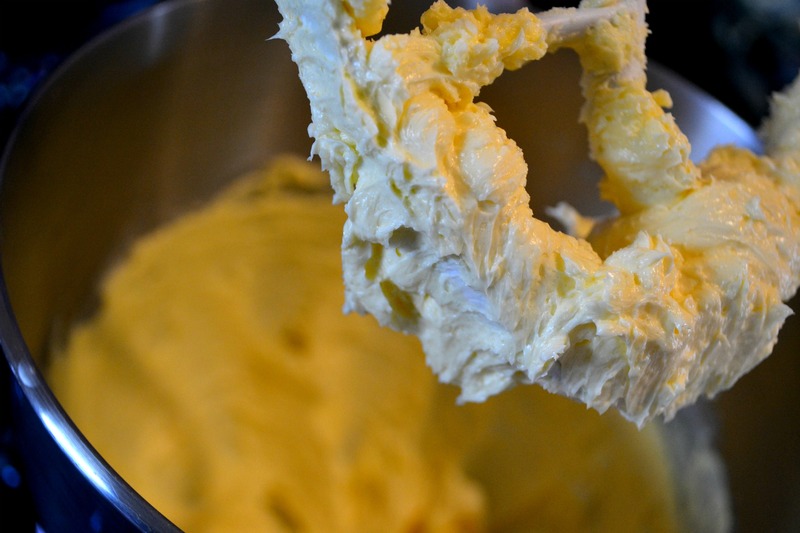 The margarine really needs to whip to a light and fluffy consistency. If you are up for an experiment, you can try using your whisk and let me know how they come out. 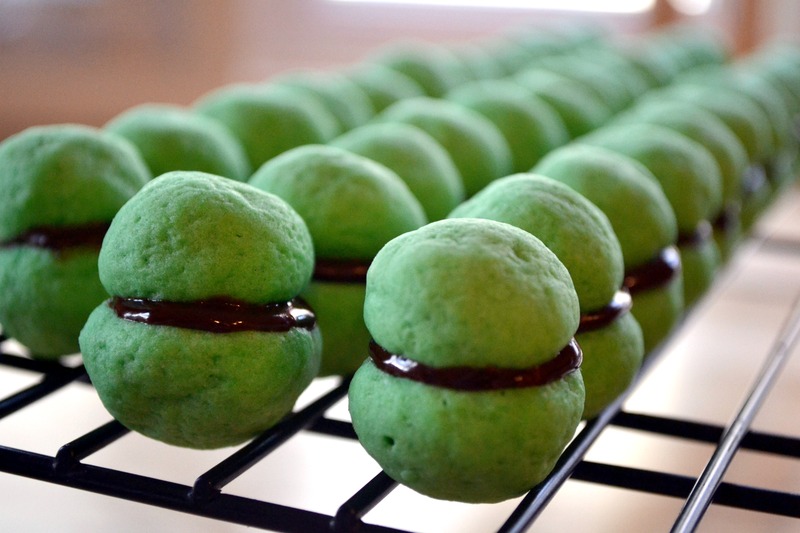 I really want to make them!! Maybe I’ll give the recipe to my mother-in-law and ask to use her Kitchen Aid.